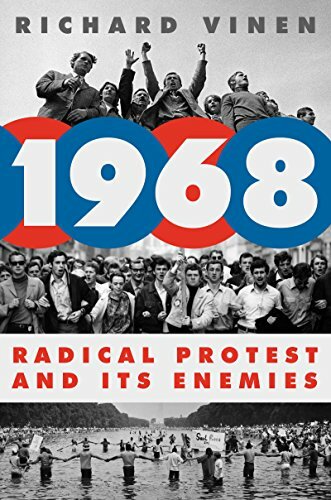 Paris, May 1968: a personal reminiscence. Our newest contributor, Michael Kopelman, is a distinguished British neuropsychiatrist. Almost exactly fifty years ago, while in Paris studying French at the Alliance Française, he became caught up in the student riots. We asked him to give our readers the perspective of a Brit who experienced these historic events at close range. His account follows below. Fifty years later, Michael Kopelman is Emeritus Professor of Neuropsychiatry at King’s College London. He formerly ran a clinical service at St Thomas’s Hospital, London. His research has been on the neuropsychology of memory disorders, including aspects of autobiographical memory and confabulation. Paris, 1968: It was chilly in March, but the sun came out in April, and Paris blossomed. In May, the city erupted. I was studying French at L’Alliance Française in Boulevard Raspail. I was in my ‘gap year’ (though the term was not then used) staying, together with a school friend, at the top of a small hotel at the crossroads between Montparnasse and the St Michel - a superb location, but the room was cheap because (in those days) the hotel lacked a lift and we were staying for several weeks. Walking along Boulevard Saint-Germain one afternoon at about 3 p.m. [from subsequent histories, I think that this must have been Thursday 2nd, or possibly Wednesday 1st, May], we heard shouts ahead of us, whistles, and drumming that appeared to be coming from the St Michel. As we approached, the noise became louder and, as the St Michel came into view, we saw that marchers were processing from North to South towards the Sorbonne, waving banners and flags, and blowing whistles and horns. Soon the marchers were gone, the sounds becoming more distant, but, as we turned into the St Michel, we could hear still the marchers ahead of us. Suddenly, there was what sounded like an explosion, the shouting intensified; there was screaming and the thumps of running. It was not clear what was going on ahead, but it sounded as if the marchers had clashed with the police. Then, out of nowhere, we were enveloped in a fog of tear gas. Our eyes were sore, we coughed and spluttered, but we bent our heads down and proceeded forward till it had cleared. As we emerged, we found ourselves at another junction. The marchers had disappeared. The police stood in the middle of the crossroads in their helmets, truncheons and shields, shouting angry commands at passers-by and observers, a large mingling crowd, now mainly elderly people and tourists. Across the road, we saw our French teacher from l’Alliance Française, but she was too distant in the melange for us to speak to her. The next morning, as we walked through the Luxembourg gardens, all was utterly calm. Another beautifully sunny day. There was no sign that anything unusual had happened the day before, but the events of the previous day were the ‘hot’ topic of discussion at L’Alliance Francaise that morning. There were more protests that afternoon and evening, and when we arrived at L’Alliance the next time, we saw that the iron gates to the entrance were closed and chained with padlocks. A placard on the gates read: ‘À cause des événements recents, l’école est fermée aujourd’hui’. The school remained ‘fermée’ for the rest of the month. That Friday evening was eventful. Early in the evening, there was shouting and drumming from the sports centre/student accommodation two doors to the right of us, as students taunted the police who had amassed outside the building. The students started to throw projectiles down at the police, who angrily threw them back, and we heard the smashing of glass. This lasted an hour or more. Later that night, we heard the shouts and bangings of the protesters, who had lit a bonfire in the middle of the crossroads between Montparnasse and the St Michel. From our room, we could observe the students watching the fire excitedly, singing and chanting, until the approach of police sirens. The police arrived, attempted to put out the fire (which was now huge), and then stood in line passively observing the fire until it died away. Eventually, the police departed, but we were awakened several times that night, as this cycle (students starting a fire, then fleeing, the police arriving and attempting to put it out) repeated itself twice more during the course of the night. During the next few days and weeks, the police massively over-reacted to what had commenced as relatively minor protests – charging at groups of students with their heavy batons, themselves protected by their Romanesque shields and helmets. Onlookers were arrested (including many foreigners and elderly people), and taken off in black police vans, which were everywhere to be seen. The entrance to the Sorbonne was sealed off by a line of police wielding their truncheons. All this fanned the flames of protest. L’Odeon was seized by protesters, and became the forum for ideological debate and revolutionary declamation. The cobbled streets were torn up, and the cobbles piled on to street barricades. In the mornings, burnt-out cars were seen on the side-streets. Trade unions joined the protesters, culminating in a general strike in which two million people marched down Boulevard Saint-Michel, observed by two English ex-schoolboys from their hotel balcony. One day, walking down the St Michel, we found ourselves in the middle of another demonstration. People were milling around, holding posters and placards, shouting and blowing whistles in the middle of a busy crossroad. Then the police appeared to the north, carrying their batons, bearing their shields and helmets, eyes covered with masks. They grouped themselves together, then charged southward down Boulevard Saint-Michel, and we found ourselves in the middle of a street battle beneath the blossoming Parisian trees. I pulled out my Yashica-Mat, and photographed a policeman as he pulled his truncheon back behind his head, about to smash it down on a young man, who held up his arm limply in self-defence as he tried to flee. All around, young people were running, some with head in hands, as the police advanced with angry determination. Just after I had taken the shot, I myself was confronted by a red-faced policeman, screaming at me to hand over my camera, and gesticulating towards a black police van, which I remember as being located off to my right [or is this detail a confabulation in my memory?]. I knew perfectly well what he was saying but, as he grew angrier, I kept repeating in English: “I’m English. I don’t understand!” Fortunately, after what seemed like several minutes, but was probably less than a minute, he let me go. As I resumed my walk briskly southward towards Montparnasse, I experienced tingles of relief, as I left the shouting and screaming behind me. Dans un article publié sur ce blog le 6 mai 2016, intitulé ‘Témoin, écrivain, multilingue et inspirateur : Qui est-il ?’, nous avions brièvement évoqué l’histoire d’Arthur Koestler, grand intellectuel juif, qui écrivit en hongrois, en allemand et en anglais. Parmi ses multiples ouvrages, Sonnenfinsternis (Le Zéro et l’Infini) est devenu le manifeste de l'anti-totalitarisme et a influencé toute une génération d'intellectuels. En 1938, Koestler se réfugie en France où il écrit Sonnenfinsternis en allemand (c'est le deuxième volume d'une trilogie commencée en hongrois). Après son arrestation par les Nazis et son internement au camp du Vernet-d'Ariège, Koestler est libéré et projette de fuir la France. Sa compagne britannique, avec laquelle il vit à Paris, traduit le livre en anglais. Ensemble, ils établissent un premier jet complet en anglais qu'ils envoient à son éditeur londonien le 1er mai 1940. Alors qu’il fuit vers le sud pour échapper à l'avancée des troupes allemandes, Koestler s'aperçoit qu’il a perdu le manuscrit allemand, avant même d'être parvenu à le faire publier. (Il en a cependant laissé une copie carbone à Paris, et une autre chez un ami à Limoges.) Il s'installe outre-Manche et adopte l'anglais comme langue d'écriture. Il actualise la traduction anglaise qui sera publiée en 1940. Le livre sera ensuite traduit en allemand, langue dans laquelle avait été rédigée la toute première version. Voilà donc un livre qui n'existe qu'en traduction. Il sera ensuite traduit dans des dizaines de langues, mais toujours à partir de la version anglaise, elle-même en grande partie traduite. Toutefois, 75 ans plus tard, en août 2015, on apprit qu'un éditeur suisse avait reçu une copie carbone du manuscrit allemand dactylographié, resté enfoui et inconnu dans une bibliothèque de Zurich... Affaire à suivre. Ce livre, écrit en français (et traduit pour la première fois en anglais - No Place to Lay One’s Head - , par Stephanie Smee; Pushkin Press, January 2018 ) est également l'œuvre d’une réfugiée de la Seconde Guerre mondiale, une Juive polonaise qui elle aussi dut fuir, et choisit plus tard de s’exiler en Suisse. Une recension de la traduction anglaise est parue récemment dans l’hebdomadaire britannique The Economist. Notre fidèle contributrice, Magdalena Chrusciel, traductrice jurée français-anglais-polonais – qui a elle aussi adopté le français comme langue maternelle –, a bien voulu adapter cette recension en français, en hommage à l'auteure du livre. « En 1921, Françoise Frenkel, jeune femme polonaise de confession juive, ouvre la première librairie française de Berlin. Elle en parle comme de sa "vocation" alors qu’un ami ose le mot de "croisade". L'aventure attire auteurs, artistes, diplomates et célébrités. À bien des égards, à ses débuts, la librairie est une plaque tournante intellectuelle. Pendant les années sombres, elle deviendra pour certains un refuge, un lieu où se reposer l'esprit – une bouffée d’air frais. Mais en juillet 1939, Frenkel doit se rendre à l’évidence : les auteurs sur liste noire et les journaux confisqués ne lui permettent pas d'assurer sa subsistance et les persécutions et violences croissantes deviennent une menace pour sa vie. Frenkel ferme alors sa librairie et quitte l'Allemagne pour la France occupée, où elle passera quatre ans. Miraculeusement, elle y a survécu, et a ainsi pu raconter son histoire. Rien où poser sa tête a été écrit et publié alors que Frenkel s’était exilée en Suisse. Le livre a ensuite disparu pendant des décennies, pour réapparaître en 2010, dans un marché aux puces. Il a alors été réédité en français. Frenkel est décédée à Nice en 1975. Le chapitre d'ouverture traite de l’enfance remplie de livres de Frenkel et de ses études à Paris, avant de couvrir ses années de libraire, avec ses hauts et ses bas. Toute la suite – en fait, la plus grande partie du récit –, est consacrée à sa lutte pour la survie dans le sud de la France. C’est grâce à son tempérament plein de ressources, et à l’aide d’inconnus, que Frenkel a pu se cacher, passant d’un abri à un autre. Elle décrit la difficulté d’obtenir un permis de résidence et l'injustice de l'arrestation. Elle évoque la souffrance d’avoir été coupée de sa famille et de ses amis, de même que l’horreur des répressions et des rafles nazies. La tension monte lorsque traquée, risquant la déportation, elle n'a d’autre choix que de fuir en traversant la frontière. Suite française (Édition Denoël, 2004) est une autre œuvre, posthume celle-là, à avoir connu une destinée extraordinaire. Le manuscrit d’Irène Némirovsky, écrivaine juive ukrainienne de langue française, morte en déportation en 1942, ne fut découvert par ses filles qu’en 1990. Elles ne commenceront qu'en 1995 à en transcrire certains passages. Le roman a reçu le prix Renaudot en 2004, faisant connaître l’écrivaine à nouveau. Émigrée en France dès 1919, elle y avait publié des romans à succès, tels David Golder, dans lequel elle brosse un portrait sans concession de la bourgeoisie de l’entre-deux-guerres. Roman inachevé en raison de la mort de son auteure, Suite française devait comporter cinq parties ; il n’en paraîtra que deux. Dans les deux parties du roman publiées – « Tempête en juin » et « Dolce » – elle dépeint la fuite de Paris vers le sud de quelques personnages, presque tous y perdant leur vernis de civilisation. Dans « Dolce », c’est la vie sous l’Occupation, avec les différences, mais aussi les sympathies, entre soldats et habitants de la campagne française. Suite française a été adapté au cinéma en 2015, avec notamment Michelle Williams, Kristin Scott Thomas et Lambert Wilson.